Last year when I read Crossed I thought there was no way Ally Condie could write anything better. I thought the story was perfect and I was hoping book 2 wouldn’t suffer the sophomore slump some middle books do. So I was pleasantly surprised when I read Crossed and it was even better than the first book! One thing I loved about Crossed was where Matched was told only from Cassia’s POV; Crossed was told from Cassia and Ky’s POV’s so we got to see inside Ky’s head which made me fall for him even more! Xander is in this book as well but he doesn’t have a POV I’m hoping in book 3 we might see all 3 of them. Crossed picks up a few months after Matched ended and you don’t miss a beat. There is much more action in this book which I was very thankful for. I think that’s why I liked it better than Matched. There was still plenty of story and with the two POV’s I felt like you got to learn so much more about the Society and the people that don’t live in the Society. I also loved the new Characters that Ally brought into the story and I feel they added so much to the story and will be a big part of the third book. The new scenery was really beautifully written gone are the Society rules and the clean sterile environments. The Carving is the main setting and it’s dirty, muddy, dusty, and breathtaking! I was thrilled that there was more poetry and symbology in this book. There’s also a pretty cool twist at the end and no I won’t spoil it for you! If you were a fan of Matched or just want a new series to read I strongly suggest buying Matched now and picking up Crossed when it hits bookstores November 11th! 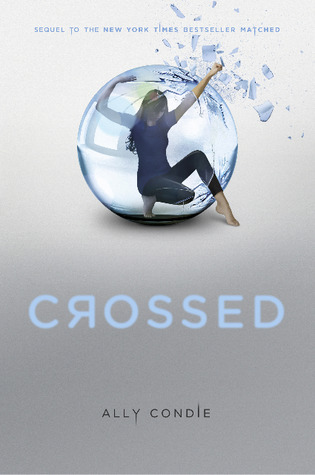 Thanks Britney from I Eat Words for lending me her ARC of Crossed! Also make sure to pre-order Crossed on Amazon and Barnes & Noble! Oh I still have time to catch up on the series! I'm always wary of books that switch from one POV to two, but you make this sound like it actually enhances the story instead of taking away from the characters. I haven't met any of these characters, but you really make this world in book two sound so good - "it’s dirty, muddy, dusty, and breathtaking!" I'll definitely have to start reading Matched ASAP! Great review once again Jaime! Yes you do Rachel! I love these books :D I can't wait for the next one! Great review, Jaime! :) So glad you liked it!